Your average Android phone is nice and portable, but the display sure is tiny. A full-sized Tegra tablet is a joy to work with, but a larger profile doesn't make for hours of comfortable gaming. 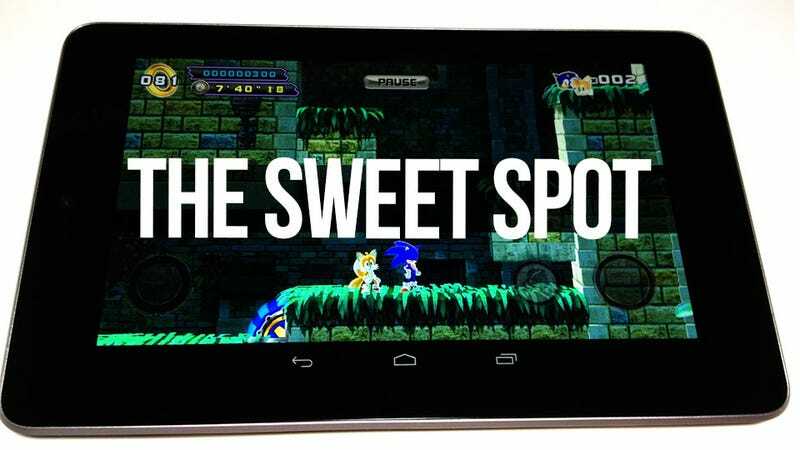 With its seven inch 1280x800 HD display, Google's new mid-sized Tegra tablet is just the right size for hours of on-the-go gaming. But what of Amazon's Kindle Fire, or Barnes & Noble's Nook? While both fall into the same size category and both are powered by Android, the Google Nexus 7 makes them look like children's toys. Google has given the likes of Amazon and Barnes & Noble enough time to mutilate its operating system into something nigh-unrecognizable. It's time to show them how it's done, and the Nexus 7 does just that. Customers flocked to the Nook and the Fire, seeking the safety of established brands to ease their entry into the world of tablet computing. The devices were loaded with restrictive front-end interfaces meant to keep new users away from the more complicated aspects of Android. Both feature a shop with a limited selection of games and apps, places to purchase books and videos; they're both very user-friendly. The Nexus 7, slowly shipping out to eager consumers as I type, also features a streamlined front-end, but behind it is an unfettered Android tablet experience. You can purchase all the apps without having to game the system, giving you more time to game on the system instead. The Nexus has the competition beat in terms of power as well. Fitted with a quad-core Tegra 3 processor and boasting 1GB of RAM, it's almost a waste to pick one up unless you plan to take advantage of the latest Tegra HD games on offer. There are plenty of pieces of screen-covered plastic that can display books, stream movies or play music. I claim this tablet in the name of gaming. I probably don't possess the power to do that, but here we are. Most of my Android gaming these days is done on an Asus Transformer Prime, the fancy Tegra 3 tablet with the removable keyboard dock. And I love playing on it. It's fast, the graphics are crisp and the touch screen is responsive. It's ridiculously expandable, storage-wise. It's unique docking feature draws attention. It's just not all that comfortable to hold it for hours on end while playing games. In its dock, or propped up in a stand with a USB gamepad attached, it's wonderful. I wouldn't call it portable. Weighing in at three-quarters of a pound, the Nexus 7 is a device that longs to be held for extended periods. It was built for this, from its slim profile to the rubbery textured back panel that makes gripping the unit both easy and comfortable. The firm grip really helps when your fingers are flying across the seven inch screen. Again, this is the perfect size for a touch screen tablet, at least for someone with slightly larger than average hands (hi!). It's so small that half of the screen is obscured by your digits, and not so big that you can't reach the middle of the display without holding the unit in one hand. I made the same observation when the Kindle Fire first came out — I gamed on my Fire quite a bit — but ultimately the limited selection of games and lack of support and updates for many of the titles I did play left me cold. The Nexus 7 doesn't have that problem. If it's on Google Play, chances are it'll play. And it'll play well. I've been going through some of my old favorites (Muffin Knight) and a host of Tegra 3-powered titles on the Nexus 7, and so far it's performed like a champ. The zombie shooter Dead Trigger; Diablo clone Heroes Call THD; Shadowgun; Dark Meadow: The Pact; all of these run gorgeously on the tablet. In fact games seem to run better on the Nexus 7 than they do on my Transformer Prime, though that might just be a function of Android 4.1 (Jelly Bean), the latest and fastest version of Google's operating system. The Nook and Kindle have their place; there are plenty of people that just want a little gaming in between chapters of their Game of Thrones eBooks. The Nexus 7 is sure to steal some of those customers away, but the true power of Google's first table computer is the way it plays. The Nexus 7 is available for purchase from Google for $199 (8GB) or $249 (16GB).